Engines in on- and off-highway vehicles need to be cooled for at least two reasons. One is based on the temperature of the burning gases in the cylinders exceeding the melting point of the block and cylinder materials. If not removed, the heat would cause the engine to fail. The second reason is maintaining optimum engine temperatures helps keep the engine running efficiently (think fuel economy) and optimizes volumetric efficiency (think horsepower). 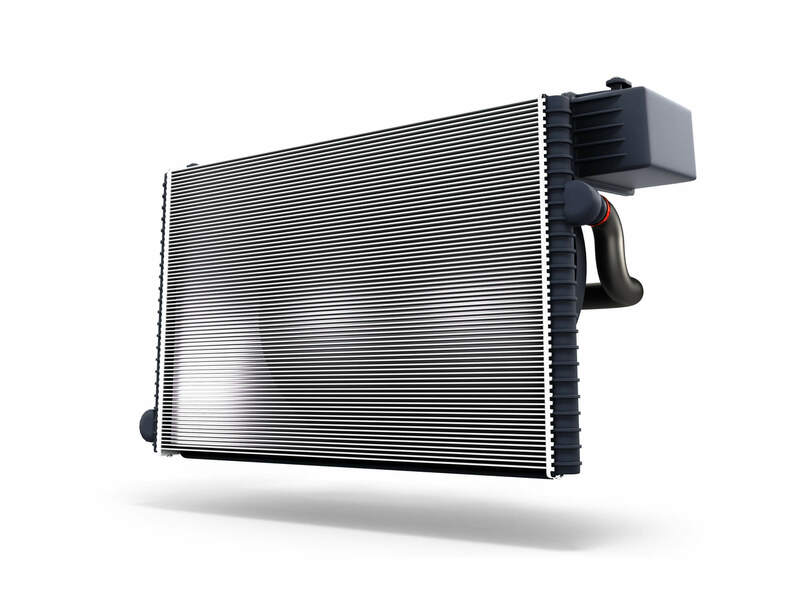 While there are different types of radiators, a common type is called a gilled tube radiator. It consists of tubes (to carry the liquid) to which rings or fins have been attached to help dissipate heat. Hot water is channeled via the tubes to the upper tank (top of the radiator) by means of the water pump. Cooler water is channeled from the bottom tank (lower part of the radiator) back to the engine to circulate through the engine block via small channels. The liquid passing through the engine block helps remove the heat, in addition to extra air being passed over it by the fan and by movement. The water pump is usually mounted at the front of the engine and driven by means of a belt. The bottom of the radiator (lower tank) is connected to the suction side of the pump. The pump spindle is driven by a belt that connects to a pulley, mounted at the end of the crankshaft. The purpose of the pump is simply to extract hot and inject cooler liquid (often a mixture of water and alcohol-based coolant) via the radiator and through the engine block to achieve cooling. The thermostat is part of the circulation system. Depending on the optimum temperature requirement of the engine, it will channel more or less liquid (by opening and closing a valve) from the radiator to the engine block. The radiator thermostat works in tandem with the fan drive thermostat. The fan drive thermostat makes the fan rotate faster or slower, depending on the cooling needs of the engine. In some applications and working environments, the radiator fan is attached directly to the engine in some fashion, often by means of a pulley and belt. The speed of its rotation, then, is governed by the RPMs of the engine and the mechanical design of the pulley/belt arrangement. In more sophisticated engine cooling systems, the fan rotation is governed by a fan drive or fan clutch, which engages or disengages from the engine drive system as cooling needs require. The two terms, “fan clutch” and “fan drive,” are interchangeable but typically fan clutch is used to refer to a friction plate design while fan drive is typically used to refer to a viscous design. The temperature sensing can be accomplished by a bi-metallic sensory system or by an electronic control. The purpose of the fan clutch is to help keep the engine within set operating temperature parameters, usually defined by the manufacturer. 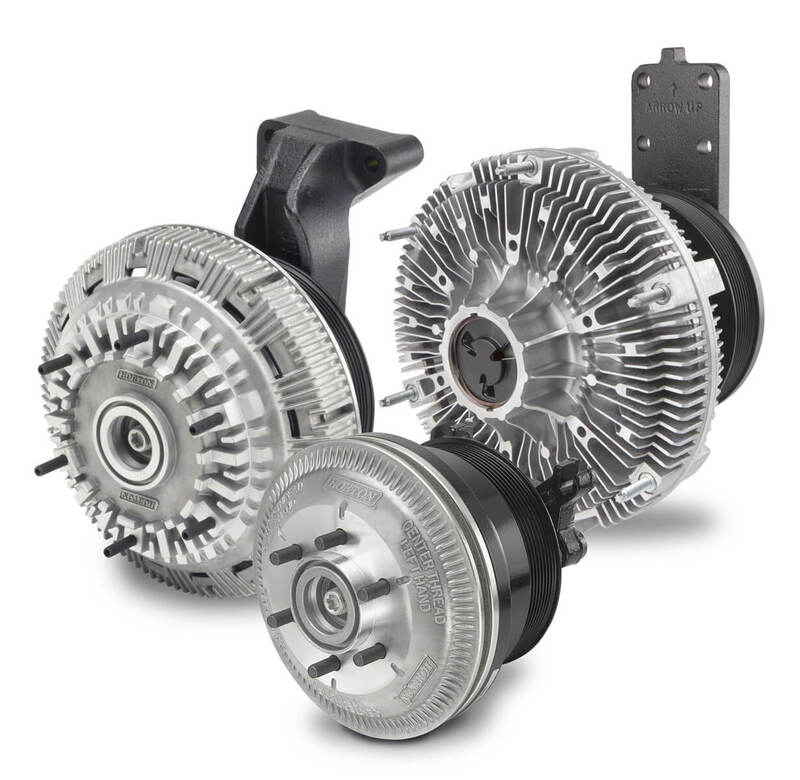 While the fan drive is driven off the engine, it is designed to “freewheel” when not engaged and engage (using the engine as the prime mover) as engine temperature increases. There are three basic types of fan drives, each with advantages in terms of features and price: on/off, two-speed and variable-speed. Fans differ in many ways, including the material from which they’re comprised and how they are manufactured or assembled. They also vary in terms of diameter, number of blades, blade length, blade pitch and hub type. 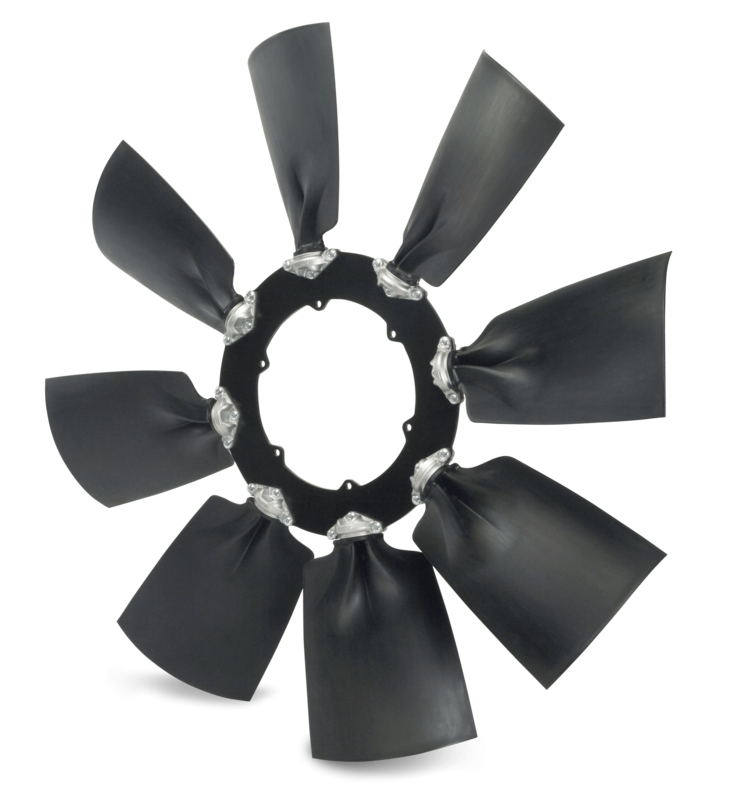 Materials include nylon or plastic, metal and hybrid materials such as the Horton HTEC (thermoset composite) fan. Molded fans are the most common and are heavily used in both on- and off-highway applications. They are typically made from plastic or nylon are of one-piece design. Modular fans are typically used in off-highway applications and offer significant design flexibility. The same hub can accommodate a variety of blade lengths, blade pitches, blade configurations and blade materials to optimize performance. Multiple hub variations increase their suitability for many applications. Metal fans are typically found in off-highway applications but are also found in on-highway vehicles. Strong and relatively light, they can be custom designed to meet precise application requirements for airflow, size, blade length, blade width, shroud type, tip clearance, fan pulley ratio speed range and other factors.